David, along with his partner Jerry Collins, is responsible for the strategic direction, operation, and profitability of Flaherty & Collins. Working with his experienced development team, David is instrumental in seeking out real estate opportunities and leading the process that turns those opportunities into successful transactions for his clients and his company. He has been responsible for the completion of hundreds of real estate transactions including acquisitions, dispositions, development, and financing. Dave is married with two children. Dave enjoys snow skiing, running, and coaching children’s athletics. 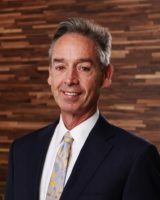 After graduating from law school in 1984, David joined Revel Companies, an Indianapolis- based full service real estate company, until 1993, when he and Jerry Collins founded Flaherty & Collins Properties.